Since 1954, McLube is a specialist in the development and production of semi-permanent mold release agents for many molding processes, particularly for the Rubber, Composites and Rotomolding industries, as well as anti-adhesive and lubricants, for all types of industries. McLube offers a range of semi-permanent release agents suitable for the various molding processes of Rubber, Composite and Rotational Molding industries. Semi-permanent release agents and baking resins: two technologies covering various manufacturing processes. McLube mold release agents offer manufacturers of technical belts, such as V-belts and drive belts, high-performance solutions for the processing of molds, vulcanising bladders and sleeves, and manufacturing drums. McLube mold release agents provide high-performance solutions for the treatment of tyre molds. The McLube product line for composites and FRPs (Fiber Reinforced Plastic) is composed of sealers and semi-permanent mold release agents. These agents are recommended for thermosetting resins, epoxy, polyester and phenolic resins. McLube agents allow mold release of organic matrix friction materials for molding temperatures up to 220 ° C.
McLube designs lubricants and non-stick coatings based on PTFE, fluorinated products and synthetic resins, specially formulated for the processing of mandrels used in various industrial pipe manufacturing processes. These products make it possible to treat different types of flexible mandrels (EPDM type, PP, PA …), as well as rigid metal mandrels (steel, aluminium, stainless steel, etc.) in order to facilitate their extraction from the pipe after vulcanisation. These dry agents do not transfer to the pipes and do not interfere with finishing and bonding. McLube also has an anti-stick agent technology for the treatment of rods during the manufacture of autoclaved vulcanization hoses. McLube has developed a protective coating of molds and metal parts against storage corrosion, based on PTFE technology, for cold application. After storage, the molds are reused directly on press without cleaning. The dry PTFE coating serves as a “base-coat”, compatible with a subsequent on-press heat treatment. 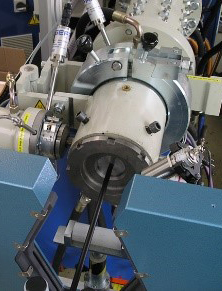 The processing of extrusion tools (filter holders, dies, etc.) with McLube technology makes it possible to reduce the clogging of these tools and to improve their cleaning significantly, thanks to a dry and durable PTFE film. The created film is colourless, steam resistant, and avoids the sticking of rubber parts during autoclave vulcanisation on trays. McLube mounting aid lubricants are designed to facilitate mounting of rubber or plastic profiles and parts to reduce stress in the workpiece. All metal surfaces, wood, rubber, plastics can be treated with McLube technology to reduce friction coefficients. McLube Piano lubricants provide low friction and excellent lubrication characteristics for use in piano tuning and maintenance. The dry, colourless lubricant coating can handle all types of keyboard tips (recess and pendulum), capstans, lever and return springs as well as different joints. Their specific formulation also prevents corrosion and discoloration of piano strings and all other metal parts of the piano. McLube MoS2 is a lubricant suitable for high temperature use on oven chains, conveyors or bearings, to protect against wear, rust and corrosion. Based on molybdenum disulphide, it does not carbonise, smoke or give off odours during use at high temperatures. 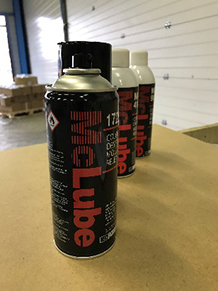 McLube MoS2 offers excellent lubrication and a low friction coefficient. Applications include steel mills, bakery ovens, oven trolleys, paint drying … The product is extremely useful in dirty and corrosive environments.